The King Cruiser was originally a car ferry, but when it sank in 1997 between Phuket and Phi Phi, it was carrying only foot passengers. There was no loss of life as the boat sank slowly and several dive boats were around the area to help. 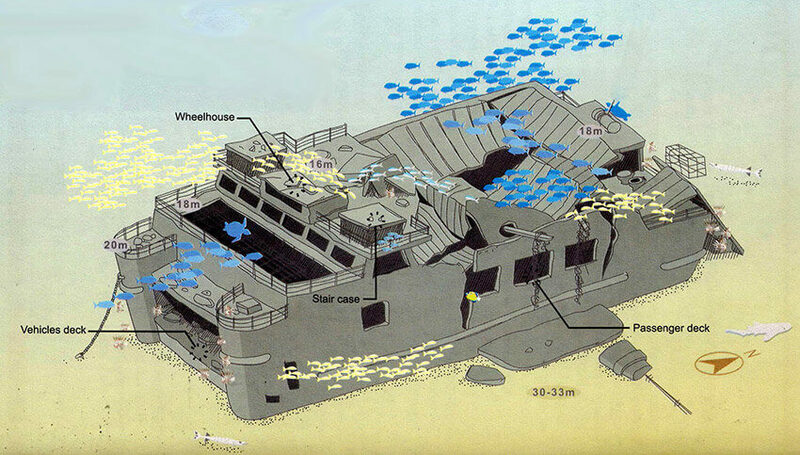 The wreck is a little to the east of Shark Point and Anemone Reef – it hit Anemone Reef causing it to sink. Good news for divers! The wreck sank in an upright position sitting on it’s twin hull. Over the last 20 years the wreck has deteriorated. 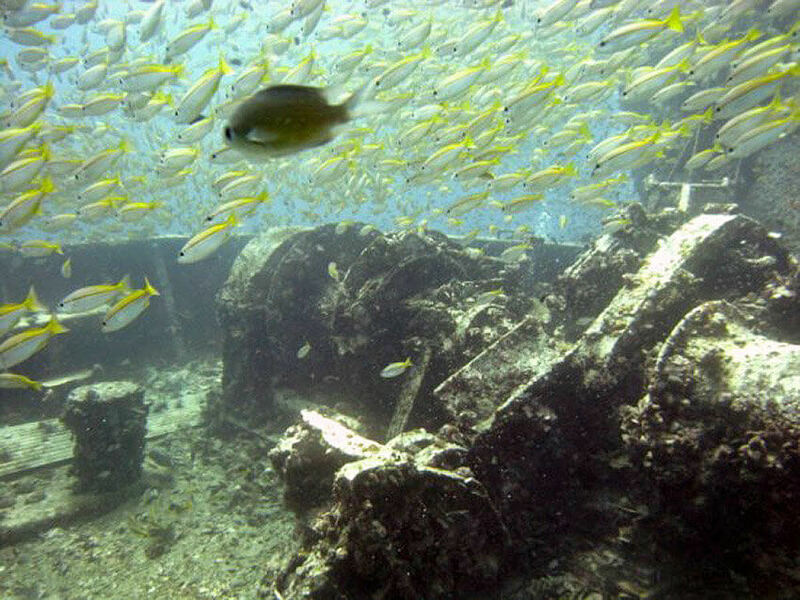 But at the same time has become a thriving artificial reef full of fish life. The King Cruiser is 85 meters long, so it’s not small. The depth is down to 31 meters and this dive site is really for advanced certified divers only. We won’t book inexperienced divers on this site. The size of the wreck gave it the nickname “Thaitanic” and due to the size, it’s worth diving more than one time. You are unlikely to see everything in just one dive. Also because the maximum depth is over 30 meters, the dive time tends to be a little shorter than other dives and you’ll need to make a safety stop before surfacing. The very top of the wreck is at about 16 meters depth. 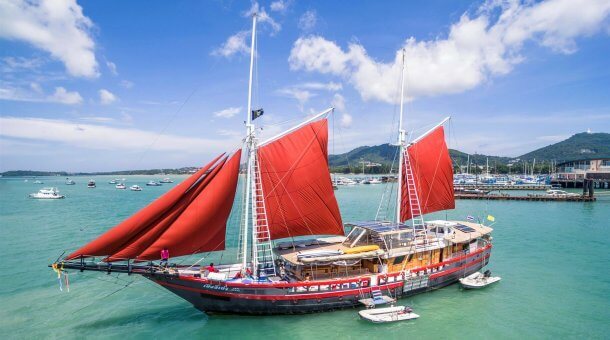 The wreck is marked by a buoy, and divers should descend and ascend using the line which is attached near the front of the boat where you can see the front of the twin hulls of this catamaran. 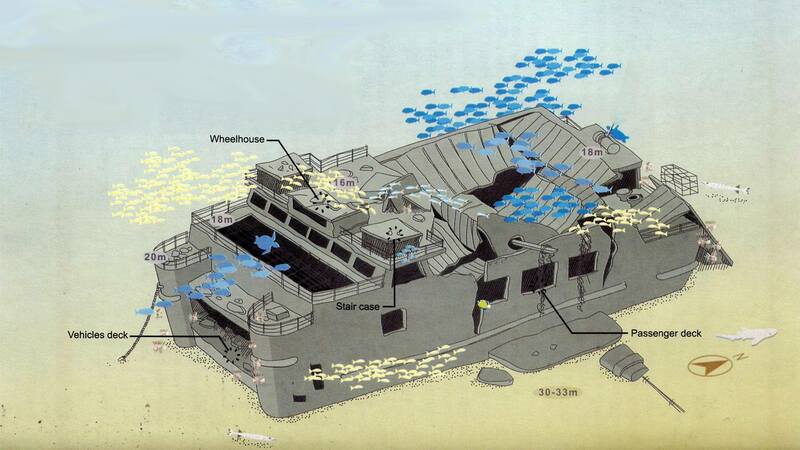 In the first few years after it sank, you could easily enter the wreck and swim through the car deck (with no cars), but this area has collapsed and penetration of the wreck is not allowed now. Marine life is bountiful. Schools of snappers hang around the shelter of the wreck, plus you’ll see many lionfish and well-camouflaged scorpionfish. Bamboo sharks or leopard sharks are sometimes seen right at the bottom of the wreck, and turtles have been known to make this home too. Be extra careful when diving here. Do not touch anything, do not put your hands on the wreck. Dive slowly. 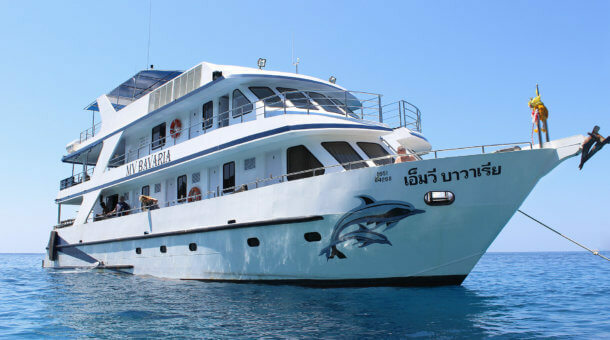 The King Cruiser Wreck can be dived year round from Phuket. 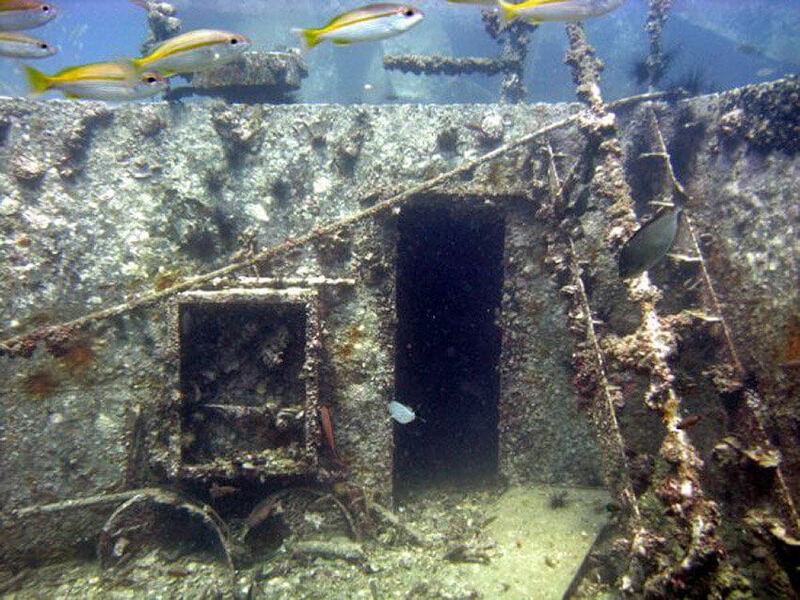 There are day trips every day – more information here : King Cruiser Wreck Day Trips. 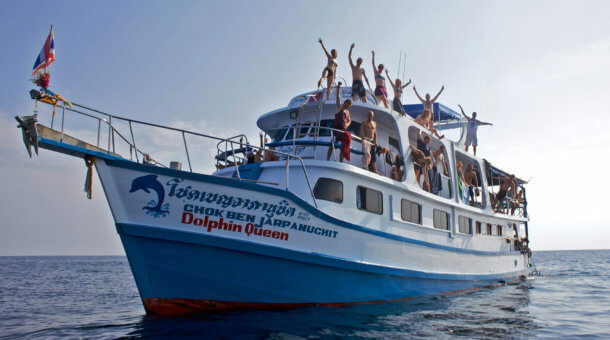 The trips include 3 dives. 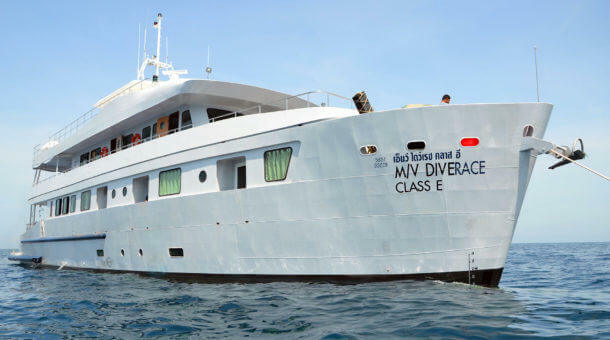 One dive will be at the wreck and 2 more dives at nearby dive sites such as Shark Point, Koh Doc Mai or Anemone Reef.